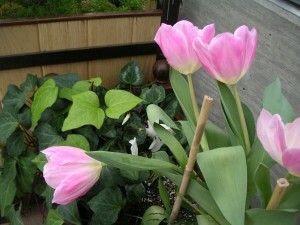 So much to see this week—spring bulbs are popping up everywhere, as well as some of the early-blooming perennials. This time of year—tenuous March—always makes me think of one of my favorite stories, The Secret Garden, by Frances Hodgson Burnett. The joy and wonder of seeing a “dead”, brown, and melancholy garden come back to life never ceases to delight and amaze. 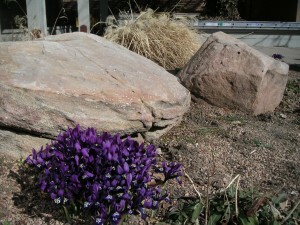 Now is a good time to start poking around in the Rock Alpine Garden. This garden, which includes more species of plants than any of our other areas, is beginning to come alive. 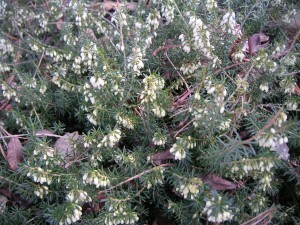 A few of the tiny jewels to be seen this week include Cyclamen alpinum, just east of the Cactus House, and Erica carnea ‘Snow Queen’, a tiny-flowered white heath. 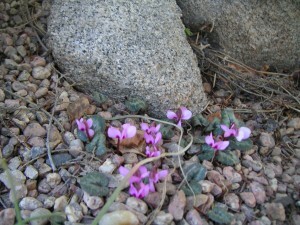 Numerous microclimates, created by the juxtaposition of rock and earth, mean that this garden blooms for nine, ten, and sometimes eleven months each year! Well, not outside quite yet, but in the warmth of the Orangery, tulips and other forced bulbs are showing off to great effect. You can also appreciate the informative signs that explain some of what goes on behind the glass of the Greenhouses. …I’d want to head straight for Mordecai Children’s Garden, which reopens to the public this Saturday. Not only is it an amazing place to learn and play, but it is also bursting with newly planted bulbs. The colors are going to be fantastic, so plan to spend plenty of time there this spring. 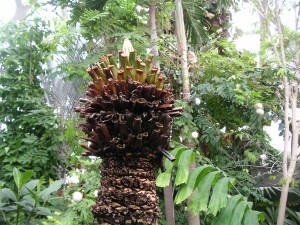 Finally, our Queen Sago cycad (Cycas circinalis), one of the oldest plants in our Conservatory, is showing signs of new growth. This cycad, planted in 1965 just before our Conservatory first opened to the public, was completely shorn of its leaves last summer, in order to control a pest infestation. Would it come back? We didn’t know for sure, but the longer days and brighter light seem to have brought it out of dormancy to take its place again as queen of the Conservatory.